Looking for a school that will support OWL methods and strategies. Check out these job listings for the 2018-19 school year! We’ll be updating this posting as we hear for more opportunities for you! Do you have an opening at your school? Contact us, we’d love to help you find a teacher that fits your school’s needs! Possesses knowledge of District policies and regulations relating to areas of responsibilities. Develops and implements activities that encourage students to be life-long learners. Plans a program of study that, as much as possible, meets the individual needs, interests, and abilities of the students with special attention given to TAG, special education, ESL and other students, who require modified programs of study. Classroom curriculum should adhere to State standards and School Board policy. Creates a classroom environment that is conducive to learning and appropriate to the developmental maturity and interests of the students. Guides the learning process toward the achievement of curriculum goals and, in harmony with the goals, establishes clear objectives for all lessons, units, and projects and communicates these objectives to students. Employs a variety of instructional techniques and media consistent to meet the needs and capabilities of individuals or student groups, recognizing the physical limitations of the space provided. Strives to implement by instruction and action the District’s philosophy of education, instructional goals and other objectives. Assesses students on a regular basis and provides progress reports as required. Seeks the assistance of District specialists as required for referrals related to exceptional education services, such as special education, gifted and talented education, ESL and the like. Assists administration in implementing all policies and rules governing student life and conduct. Develops reasonable rules of classroom behavior and maintains order in the classroom. All classroom rules should be consistent with School Board and building policies. The Bethel School District is seeking teacher applicants who have the potential to be leaders and innovative educators. Successful candidates will demonstrate the ability to deliver instruction based upon best available research and practices in teaching and learning. If you are a current Bethel School District employee, you must complete an INTERNAL application. All other applicants, including current substitutes, must complete the standard application. •Valid and appropriate certificate and endorsements for Washington State required. •Meet requirements of Every Student Succeeds Act. •Demonstrated ability to develop and maintain effective classroom management. •Demonstrated ability to successfully employ effective teaching methods. •Demonstrated desire and ability to work and communicate effectively with staff, students and parents from diverse cultural backgrounds. •Previous successful teaching experience at grade level/subject preferred. •Understanding of Common Core Standards. •Demonstrated ability to differentiate instruction, and use a variety of instructional strategies and methods appropriate for student learning needs. •Ability to integrate technology with the curriculum. •Problem solving abilities and critical thinking skills. •Ability to organize ideas, time and materials to accomplish goals. •Demonstrated ability to work collaboratively and plan with other staff members through Professional Learning Communities. •Desire and willingness to continue to learn and pursue professional development. •Be enthusiastic, flexible and have a commitment for students to reach high learning standards. •Willingness to accept extracurricular assignments. Deer Park ISD, Houston, TX! High School – Spanish Teacher at South Campus General Statement of Responsibilities: To motivate pupils to develop skills, attitudes and knowledge needed to provide a good foundation, in accordance with each pupil’s ability. Responsibilities:  Evaluate the needs of each student to accommodate individual learning styles.  Create informative lesson plans to foster mastery of all material.  Develop effective classroom procedures to facilitate daily instruction.  Manage behaviors to promote self-discipline.  Provide a well-balanced and open-minded educational environment which encourages and motivates students to achieve and surpass classroom standards, individual interests and future goals.  Utilize outstanding verbal and written communication skills.  Be detail oriented and well organized.  Capable of maintaining discipline with large groups of students while preserving one-on-one assistance.  Maintain appropriate teacher-student rapport at all times.  Keep accurate and complete records and render reports that are required by law, board policies, and/or administrative directives.  Seek and utilize opportunities for further professional growth through in-service education, further study, and supervisory and consultative services provided by the district.  Utilize technology both in classroom instruction and in record keeping as required by the district.  Maintain and improve technology skills through district-offered training and personal skill development.  Use school supplies effectively and economically.  Care for and protect school property that is used for instructional purposes.  Cooperate and participate in the planning, implementation and evaluation of the instructional program.  Assist in the selection of textbooks and of other teaching and learning aids.  Establish and maintain a professional working relationship with administrators, fellow teachers, pupils, parents and the community.  Respect the personal worth, dignity and rights of pupils.  Maintain professional certifications as required by the Texas Education Agency.  Perform such other professional duties and responsibilities as may be directed by the principal. Cushing Academy seeks an experienced, energetic and dynamic teacher of Latin to begin August 2018. Responsibilities include teaching four or five sections of high school Latin and supervising two seasons of athletics or other extracurricular activities. On-campus housing is included along with duties as a dormitory supervisor; 3-5 years of teaching at the high school level is required. Successful candidates will display an interest in engaging in all aspects of a boarding school community and share Cushing’s commitment to diversity. Bachelor’s degree in Latin or related field required; master’s preferred. Qualified candidates for this position may also apply to serve as Department Head of the Classical and Modern Language Department. The Department Head serves to align the department with the vision and mission of the school. He or she is responsible for creating a critical, creative, challenging, and supportive learning environment among colleagues and students. The Department Head fosters and supports a culture of collaboration, feedback, and reflection; advocates for the needs of individual members and the department as a whole; and serves as a liaison for internal and external constituencies. The Department Head reports to the Dean of Academics. School Overview: Charles R. Drew Charter School opened in 2000 as Atlanta’s first charter school and is an integral part of holistic neighborhood revitalization led by the East Lake Foundation. Drew Charter School serves over 1,600 children in Pre-K through 12th grade, growing ultimately to serve over 2,000 students from “cradle -to-college” with two onsite early learning partners. Drew’s innovative academic model of Project-Based Learning (PBL), incorporating a Science Technology, Engineering, Arts, and Mathematics (STEAM) theme, has effectively closed both the achievement gaps and the opportunity gaps for children from diverse backgrounds. Position Description: Classroom teachers are expected to plan, organize and implement an appropriate instructional program in a learning environment that guides and encourages students to develop and fulfill their academic potential. This position reports to the Senior Academy (SA) Principal. • Establish and enforce rules for behavior and procedures for maintaining order among the students for whom they are responsible. • Observe and evaluate students’ performance, behavior, social development, and physical health. • Prepare materials and classrooms for class activities. • Adapt teaching methods and instructional materials to meet students’ varying needs and interests. • Instruct students individually and in groups, using various teaching methods such as lectures, discussions, and demonstrations. • Assign and grade class work and homework. • Prepare, administer, and grade tests and assignments in order to evaluate students’ progress. • Confer with parents or guardians, teachers, counselors, and administrators in order to resolve students’ behavioral and academic problems. • Meet with parents and guardians to discuss their children’s progress, and to determine their priorities for their children and their resource needs. • Maintain accurate and complete student records as required by laws, school policies, and administrative regulations. • Prepare objectives and outlines for courses of study, following curriculum guidelines or requirements of states and schools. • Enforce administration policies and rules governing students. • Confer with other staff members to plan and schedule lessons promoting learning, following approved curricula. • Use computers, audiovisual aids, and other equipment and materials to supplement presentations. • Prepare for assigned classes, and show written evidence of preparation upon request of immediate supervisors. • Collaborate with other teachers and administrators in the development, evaluation, and revision of elementary school programs. • Instruct and monitor students in the use and care of equipment and materials, in order to prevent injuries and damage. • Plan and supervise class projects, field trips, visits by guest speakers or other experiential activities, and guide students in learning from those activities. • Drew Charter School offers our full-time staff members a broad, generous benefits package. 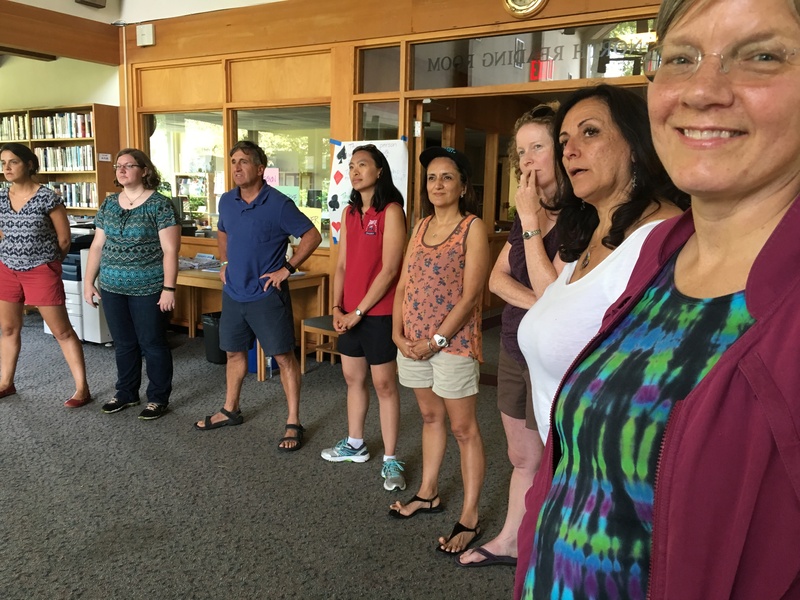 The Portsmouth NH School Department is seeking dynamic teachers excited to join our professional learning community. Successful candidates will evidence a passion for teaching and learners, demonstrate an ability to collaborate with colleagues as part of a team, be able to design and implement lessons that are engaging and differentiated and possess a strong commitment to academic excellence for all students. The Portsmouth School Department is a premier NH district committed to providing a rigorous and engaging educational experience for all students characterized by personalization. All learners are provided rich exposure to the arts and athletics and we proudly graduate every student career or college and citizenship ready. The Portsmouth School Department uses a Professional Learning Community model to ensure teachers can frequently monitor student progress. This is a full time position in the Middle School teaching five sections primarily of French but of Spanish as well in the WLC Department. In addition to teaching, the position involves serving as an advisor for a group of 8-10 students as well as supporting the Middle School extra-curricular programs by coaching and/or leading a major activity. A background and interest in world languages and cultures would be helpful in this position as well as an interest in helping to develop an extracurricular activity with a global focus. Qualifications: A successful candidate will have a BA degree in French or Spanish; an MA is preferred. Ideally, we would love a native speaker in either language and fluency in both languages. He/she should have three to five years of experience teaching in an independent school setting, possess excellent oral and written communication skills and a demonstrated ability to serve as a collaborative member on a grade level team. Cushing Academy (Ashburham, MA) seeks an experienced, energetic and dynamic teacher of Spanish to begin August 2018. Responsibilities include teaching four sections of high school Spanish and supervising two seasons of athletics or other extracurricular activities. On campus housing is included along with duties as a dormitory supervisor. 3-5 years of teaching at the high school level is required. Successful candidates will display an interest in engaging in all aspects of a boarding school community and share Cushing’s commitment to diversity. Bachelor’s degree in Spanish or related field required; master’s preferred.